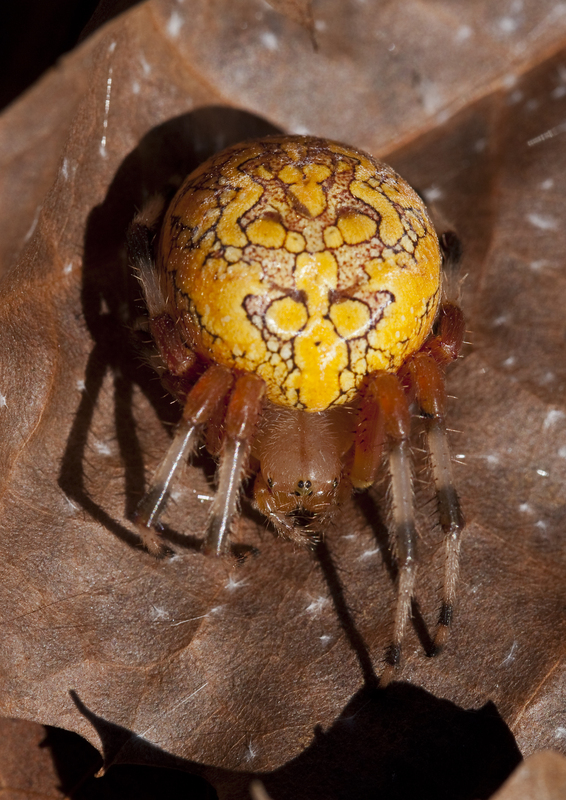 Every year about this time I run into (sometimes literally) one of my favorite spiders, the striking Marbled Orbweaver, Araneus marmoreus. 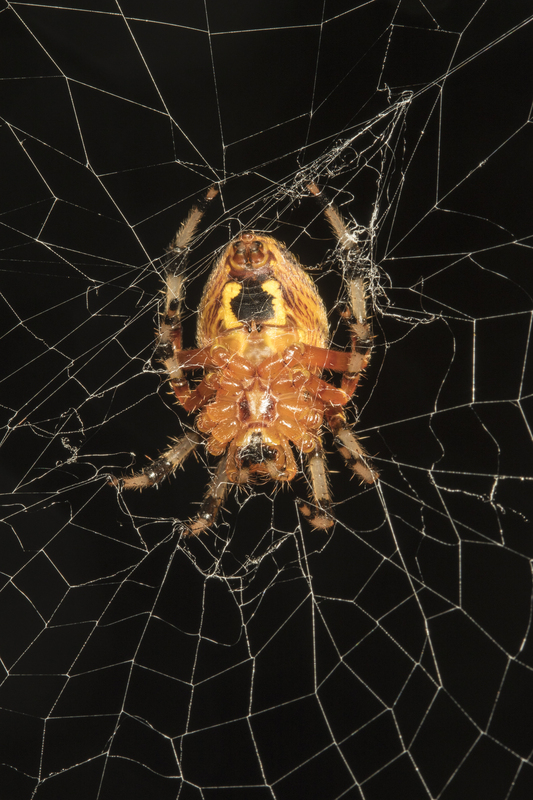 This widespread beauty is usually seen in late summer and fall, hanging out in her large circular web, or, as is often the case, hiding nearby. 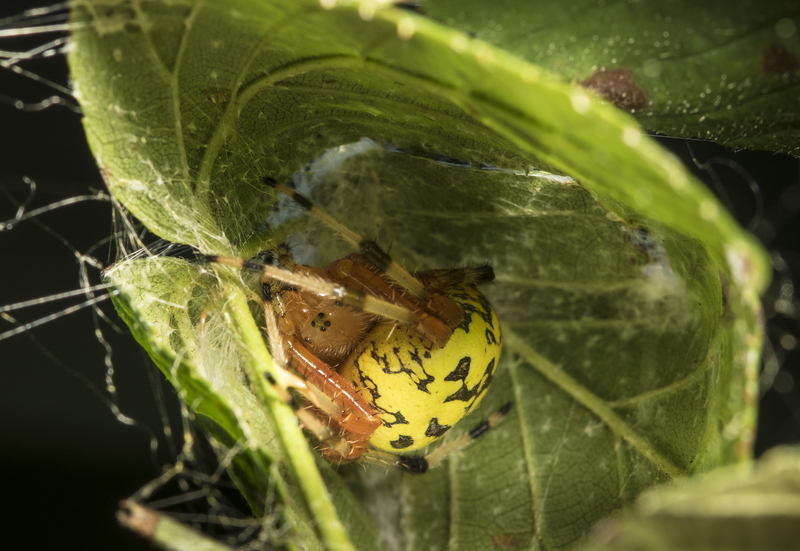 This species generally has a hiding place just off to the side of her web, usually in a curled leaf. 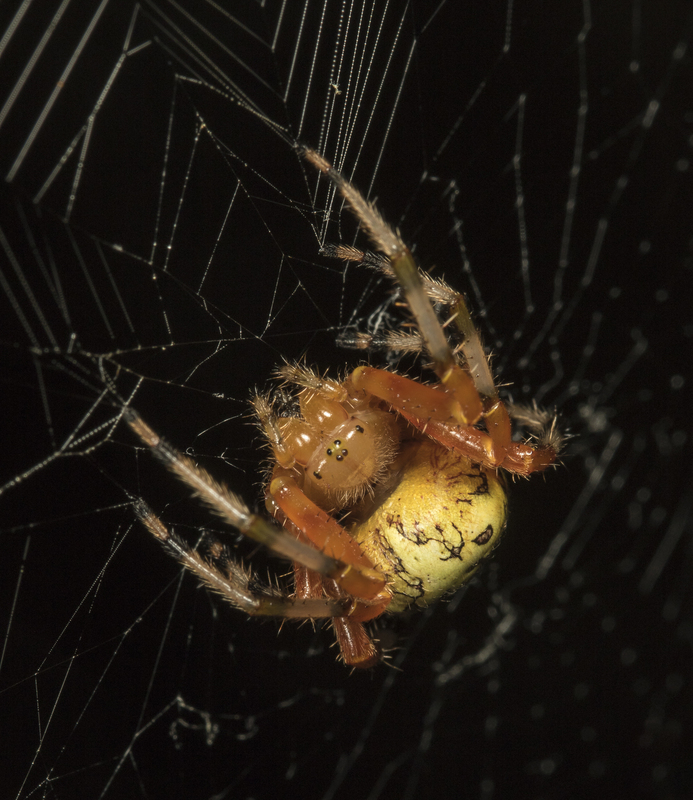 She keeps up with the goings-on in her web by means of a connecting strand of silk that acts as an alarm when something hits her silken trap. When an insect is caught, she will run out and engage it, wrapping it in silk and injecting venom which will subdue the prey and set the stage for her dining pleasure. Their dorsal view is spectacular, usually with a bright yellow background with some interesting ghoulish dark patterning. They can vary in color but I have read that they tend to turn darker with age and often appear more orange than yellow just in time for our pumpkin-spiced holiday. The picture above is from the archives of one I photographed several years ago in early November in Great Smoky Mountains National Park. Underneath, they are less striking, but colorful nonetheless. You can also appreciate the black bands on the legs a bit better when not distracted by the bright colors of their top side. I stumbled into this particular web this past weekend while looking for seeds for a program at work. Luckily, I only brushed against the web before realizing my mistake and was able to pull back without ruining her day’s work. 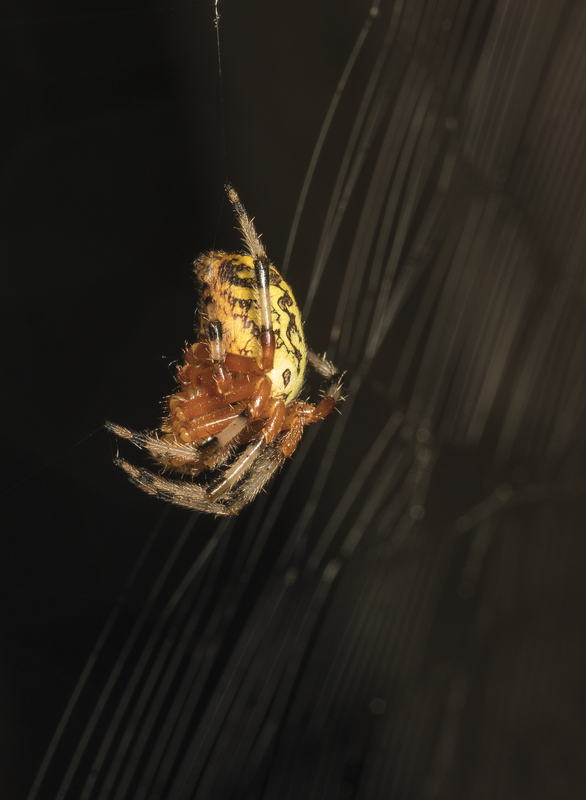 As with many orbweavers, this species often makes a new web every evening. In spite of their association with spooky themes like this special holiday, I find these spiders particularly beautiful and a welcome addition to our woods. 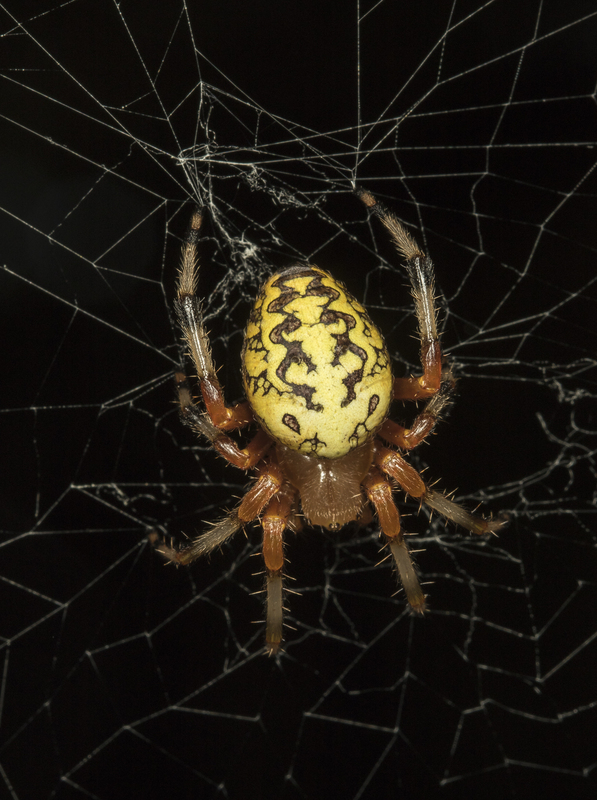 This entry was posted in Natural History and tagged marbled orbweaver spider by roadsendnaturalist. Bookmark the permalink. Always a fall favorite…nice shots of this beauty!